Imagine you had a magic red button that when pressed, could make all your dreams and desires come true. You want someone to fall in love with you? Click the button, and it happens. You want more money, or a new car? Click the button, and it’s yours. You want to change job? Give up smoking? Lose weight? Click…click…click… Like the genie in the bottle, the magic button provides, every time. Of course, there’s no such thing as a magic red button. But you can make your dreams and desires come true more easily than you ever thought possible. How? By harnessing the power of morphic fields. Morphic fields are an exciting new branch of scientific research. These subatomic energy patterns connect everything on the planet together, including you, me, and anything that you might desire. And because you’re already connected to everything through morphic fields, you can use them to obtain whatever it is you want. They are the closest thing to a magic red button. It sounds almost too good to be true, but in reality people have been using morphic fields for centuries, they just didn’t know it. The law of attraction, the tarot, cosmic ordering, or just plain old NLP and positive thinking are all ways of using morphic field energy to manifest our desires. They all work, to a degree, but they’re not very efficient, because they were all created in ignorance of the science that makes them possible. Now, with the benefit of the latest research, including thousands of our own test subjects, we can share with you a simple, no-nonsense method for tapping the power of morphic fields directly. We’ll show you a step by step processes you can use for common goals, and how you can adapt these ‘recipes’ to get about anything else you could ever want. • Make almost anyone fall deeply and genuinely in love with you, even an ex! 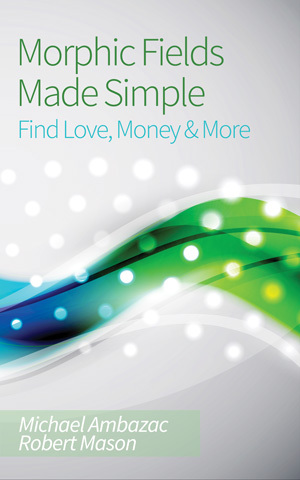 • Attract money and wealth into your life. • Get the job you want. • Easily beat any addiction. Smoking, drinking, gambling, and anything else you want to quit. • Lose weight and get fit without having to worry about difficult diets. • Boost your self confidence. • Make new friends easily. • Improve your memory, and learn new skills effortlessly. If you’re tired of self improvement systems that promise the earth but deliver little or nothing, then morphic fields will be a revelation to you. You don’t need any special skills or tools to use the processes you will learn, because you already have everything you need. We’ll show you how to use your very own brainwaves to manipulate and control morphic field energy. With the exercises and techniques we’ve developed over the last ten years, you’ll be raring to go in no time.